It's a landmark of Hillcrest: the pride monument on University Avenue and Normal Street. "This is the monument that tells the LGBT history of Hillcrest," said Benjamin Nicholls, executive director of the Hillcrest Business Association. Last week, Nicholls discovered that the landmark, which is topped with a pride flag, had been vandalized. "It's a real tragedy because it's trying to deface the history of this community," added Nicholls. Two pictures on two of the plaques near the base of the monument were scratched and gashed. One shows the original local LGBT center, the other portrays activists lifting the pride flag. "It looks like someone has taken a screw driver," said Nicholls. 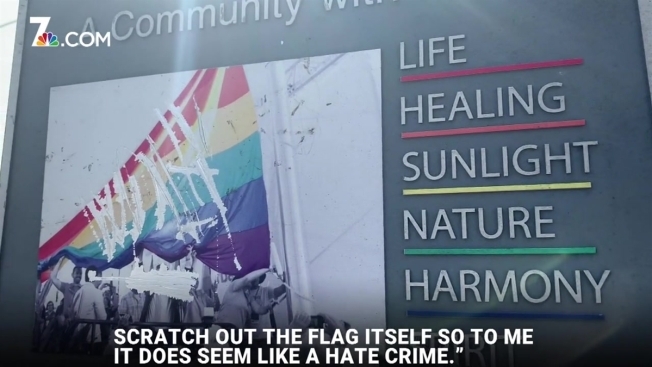 "Because of where the damage is, on the flag itself and activists' faces, it does seem like a hate crime to me." The Hillcrest Business Association said they do not have leads on who might have done this. They will have to remove the plaques and ship them to the manufacturer in Los Angeles. It could cost up to $10,000, Nicholls estimates. Some businesses in the community have stepped up to help. Down the street, Crest Cafe is giving $20 off customers' bills if they donate $20 to fixing the monument. "We care a lot about the community and we know the monument is a big part of it," said Enrique Mendina, general manager of the Crest Cafe. If you would like to donate to restoring the monument, click here.